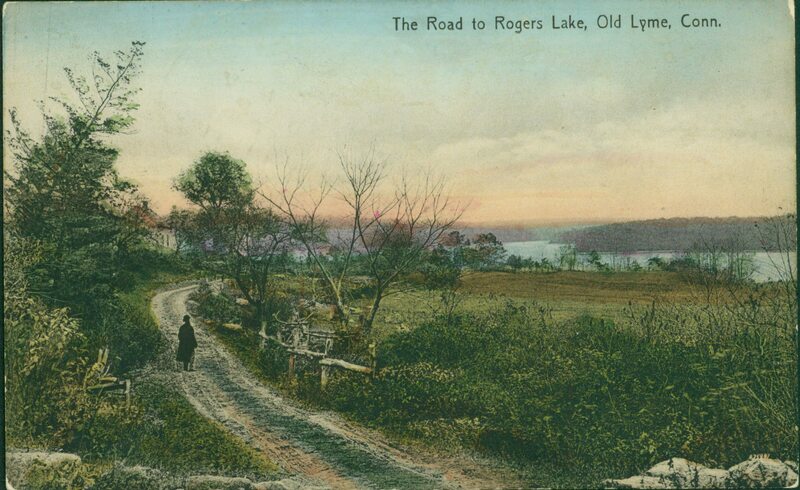 Assertions that Fidelia Bridges “introduced Oliver Lay to the pleasures of Connecticut” ignore the portraitist’s longstanding ties to Old Lyme where his ancestor John Lay (1633–1696) settled in the 1650s. 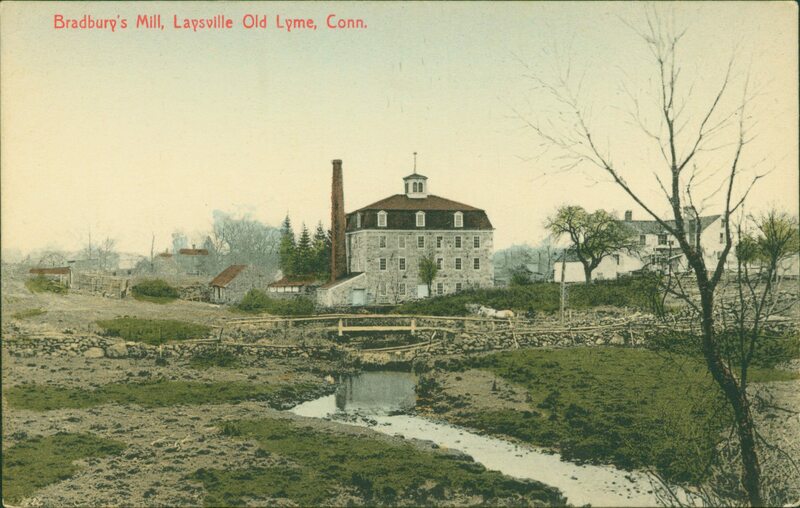 Members of the Lay family remained substantial property owners in the town for more than two centuries, and Oliver Lay spent all his boyhood summers in the section north of the village called “Laysville.” There his father’s brother Squire Oliver Ingraham Lay (1799–1876), for whom he was named, erected a handsome stone mill in 1839 and served for many years as judge of probate. Young Oliver began recording his sketches in Laysville at age fifteen. “Made a study of a tree on canvas 9 x 11 not very good, finished May 25th back of [Marvin] Huntleys with water &c,” he wrote in a notebook that would chronicle his artistic efforts between 1861 and 1898. 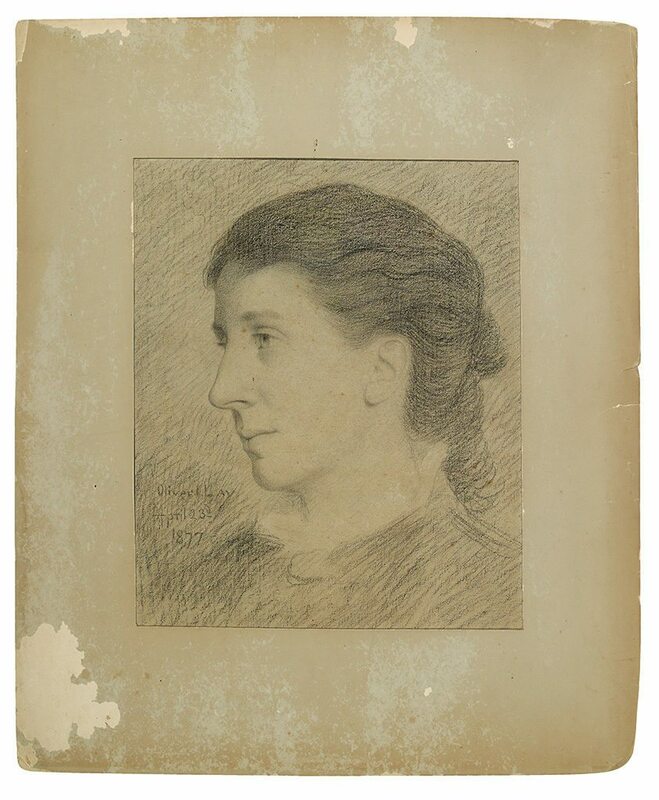 Fidelia Bridges had already made sketching trips with her Philadelphia mentor William Trost Richards (1833–1905) to Lake George and the Lehigh Valley by the time she met Oliver Lay in Brooklyn in 1865. 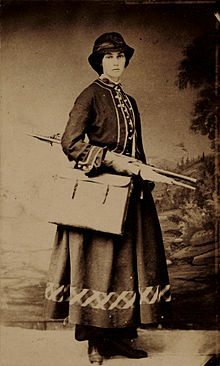 A carte de visite photograph likely taken the previous year shows her posed with a wooden paint box and a folding umbrella against a rocky woodland backdrop. 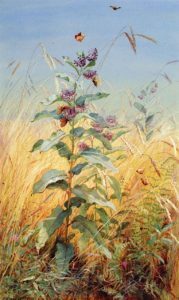 Her early paintings in oil, portrait-like studies of the natural world, display an intimate, often exuberant, observation of landscape details. After traveling for a year in Europe, she returned to Brooklyn in 1868 and resumed work in her studio along with her friendship with Oliver Lay. 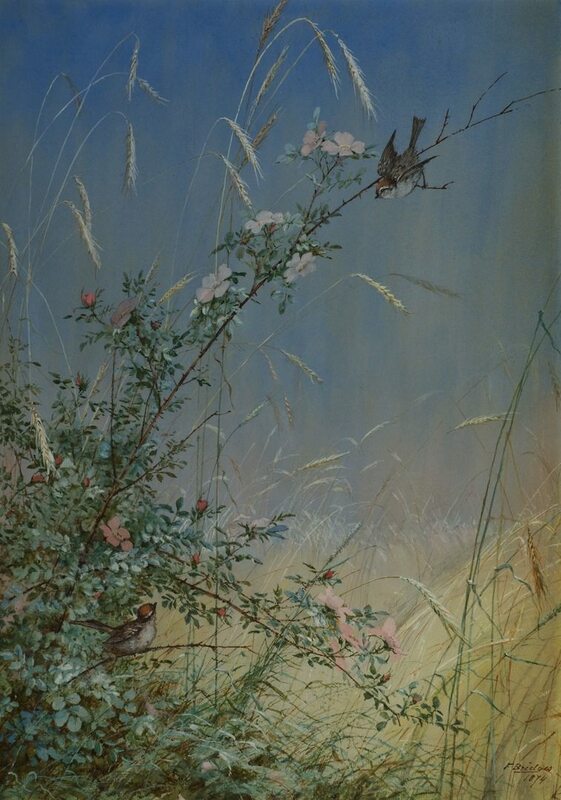 In 1871 she began working primarily with watercolors. Oliver Lay almost certainly described to Fidelia Bridges the natural beauty and abundant bird life of his family’s Connecticut home. 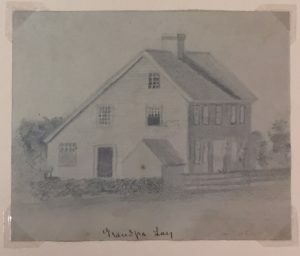 He had mentioned to a cousin in 1871 his own eagerness “to make an album of Lyme sketches—say a picture of the Factory and Hardings house and the brook and the school house with Grassy Hill in the distance and a huckleberry scene with Aunt Lynda & Uncle Prentice [Comstock]… don’t you think they’d be interesting? I’ve had them on my mind for some time.” In 1872 he completed a series of detailed pencil studies of the imposing rock clusters near his Uncle Oliver’s factory as well as the salt box-roofed home of his grandfather David Lay (1769–1843). An invitation to exhibit three paintings at the Philadelphia Centennial Exposition in 1876 enhanced Fidelia Bridges’ already prominent reputation. 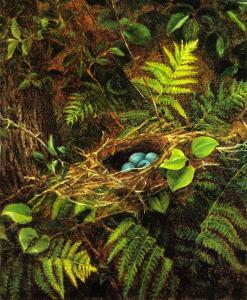 “Her works are like little lyric poems,” landscape artist John Frederick Kensett (1816–1872) had written the previous year, “and she dwells with loving touches on each of her buds, ‘like blossoms atilt’ among the leaves.” Although Miss Bridges rarely identified the settings of her paintings, “A Kingfisher and Catkins” and “Corner of a Rye Field,” exhibited in Philadelphia, could well have been sketched along the Mill Pond near Oliver Lay’s family home. 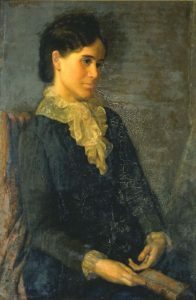 Two months after the Philadelphia Exhibition opened in May, she returned for her last summer in Old Lyme and settled again into a rented house near scenic Rogers Lake. Aided by a faithful servant Hannah Fry “and a younger Fry,” Fidelia was also accompanied during the summer months of 1876 by her older sister Elizabeth Bridges (1831–1882) and “their great Maltese cat” who, Mr. Lay noted, had landed safely “after hours of anxious solicitude on the cars.” The sisters “are taking life as comfortably as they can,” he added in a letter to a mutual friend. On daily visits he offered assistance and encouragement after Fidelia had trudged through meadows and rowed under a hot sun along the lakeshore. 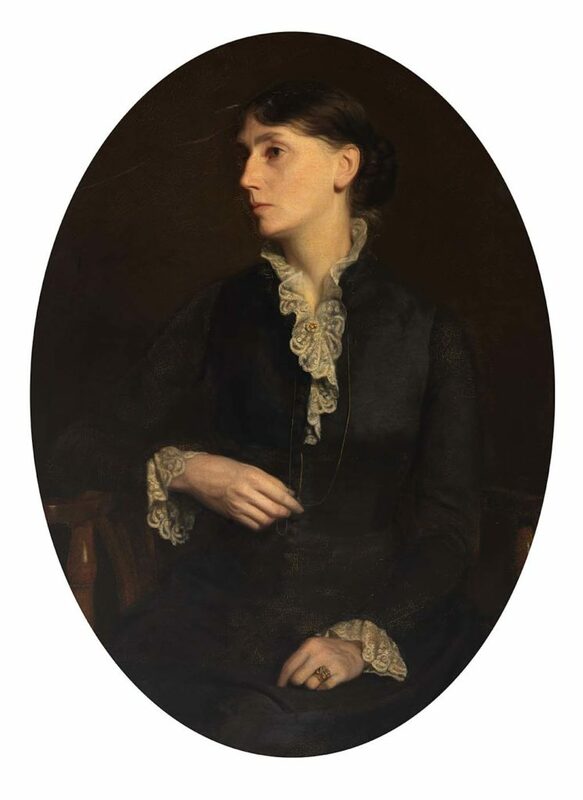 “I keep at work grinding out picture after picture after picture in such constant succession that I begin to feel like a picture machine,” she wrote to her friend Anna Brown. After Mr. Lay left Lyme in August 1876 for a portrait assignment up the Hudson, he wrote to their mutual friend that he quite missed the Misses Bridges, “for we did a great deal of walking and boating together.” He also expressed his admiration for her recent achievement. “You will be delighted to see her summers work,” he told Mr. Walker. “She is doing better than ever and finds Lyme quite full of subjects.” She had also found new outlets for her sketches. 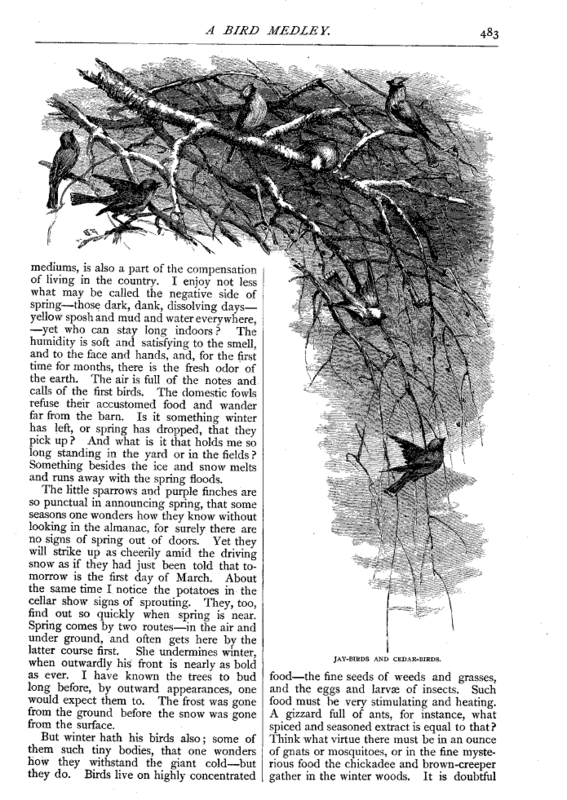 The previous month her delicately expressive bird studies had appeared in Scribner’s Magazine to illustrate an article by literary naturalist John Burroughs (1837–1921). “I am glad you saw the illustrations in Scribners,” Mr. Lay wrote. 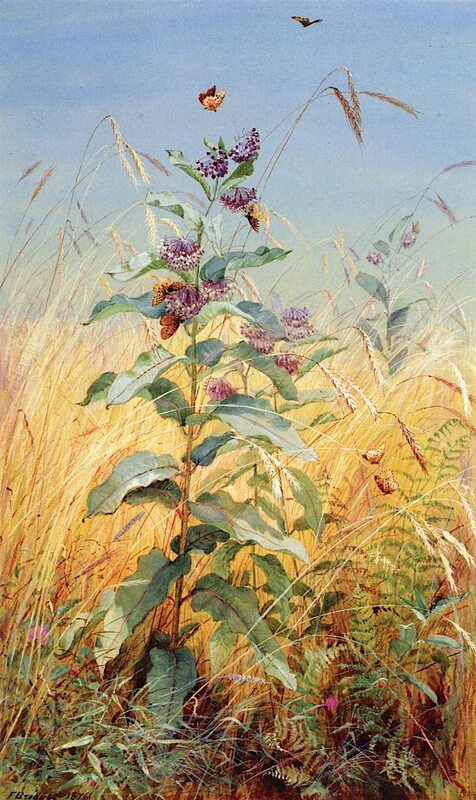 “I think they are quite beautiful, there is one in St. Nicholas for July and others to follow. 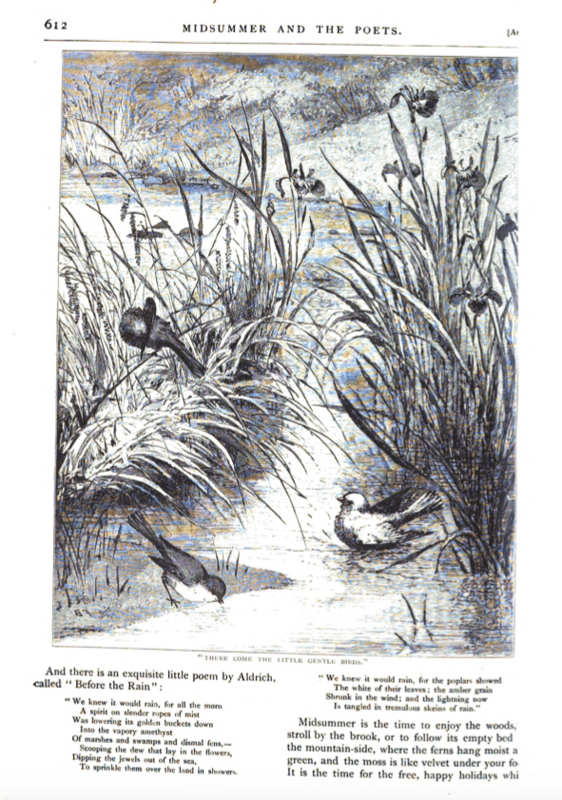 I thank you for your offer to send me one but I have mine which I intend to keep.” St. Nicholas Magazine, launched by Scribner’s for a youth audience, had published in August a sketch by Fidelia Bridges to accompany a summer feature article that introduced children to nature poetry. Oliver Lay painted a second portrait of Fidelia Bridges in 1883 not long after the death of her sister Elizabeth. Miss Bridges sat for her friend in an elegant black dress accented with gracefully draped lace at the neck and wrists, gazing pensively into the distance. 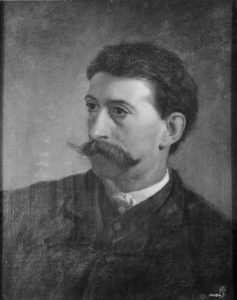 Apparently because of the portrait’s size, the National Academy of Design refused the painting for its spring exhibition. Mr. Lay’s record book notes that he took it back and cut down both the canvas and the frame. The eloquently expressive portrait of Fidelia Bridges, age 49, appeared in the Academy’s fall 1884 exhibition. Special thanks to curator Jennifer Stettler Parsons for generous assistance. 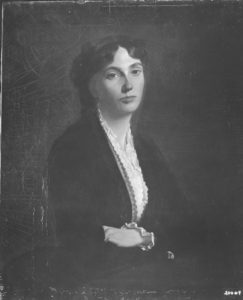 Ellen Noyes Chadwick to Martha J. Lamb (Coleman), November 5, 1874, in Martha J. Lamb Papers, New York Historical Society. 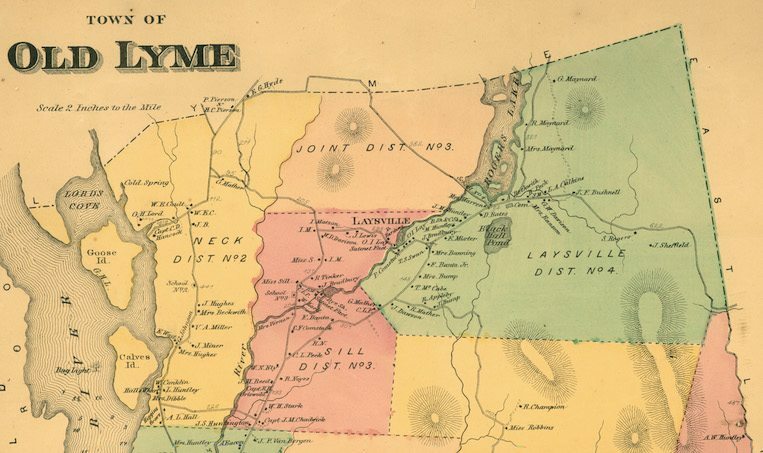 Old Lyme continued to be referred to as “Lyme” after the southern portion of the original town officially separated in 1857. 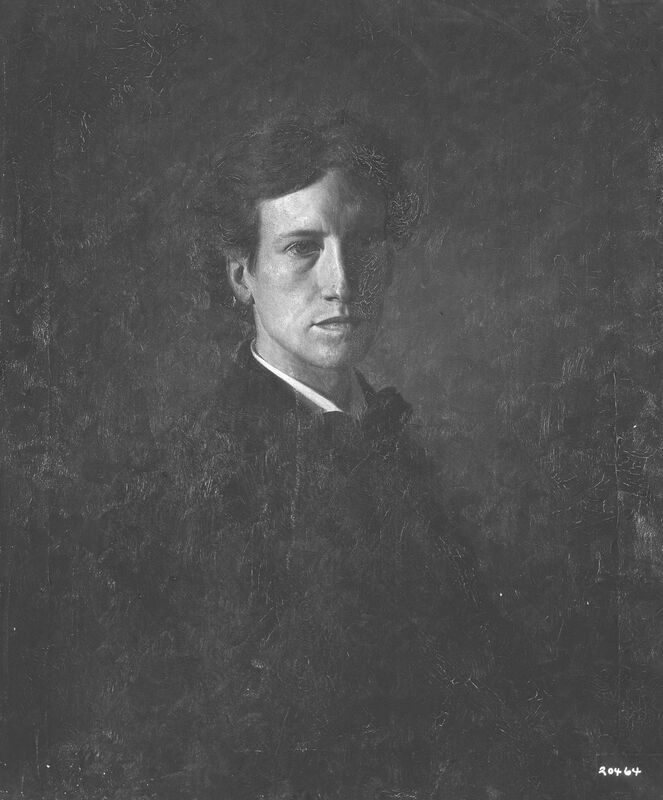 David Bernard Dearinger, Paintings and Sculptures in the Collection of the National Academy of Design, 1826–1925 (Hudson Hills, 2004), p. 351. Oliver Ingraham Lay, Record of His Works, 1861-89 (hereafter Record), filmed 1972 by the New-York Historical Society. Photocopy, Lyme Historical Society Archives at the Florence Griswold Museum (LHSA). Kathleen A. Foster, American Watercolor in the Age of Homer and Sargent (Philadelphia, 2017), pp. 156-157. Oliver I. Lay to Mrs. Brown (New York, December 23 . Photocopy, LHSA. Oliver Ingraham Lay, Record, #206. Oliver Lay to Cousin Frances, New York, March 2, 1871. Photocopy, LHSA. 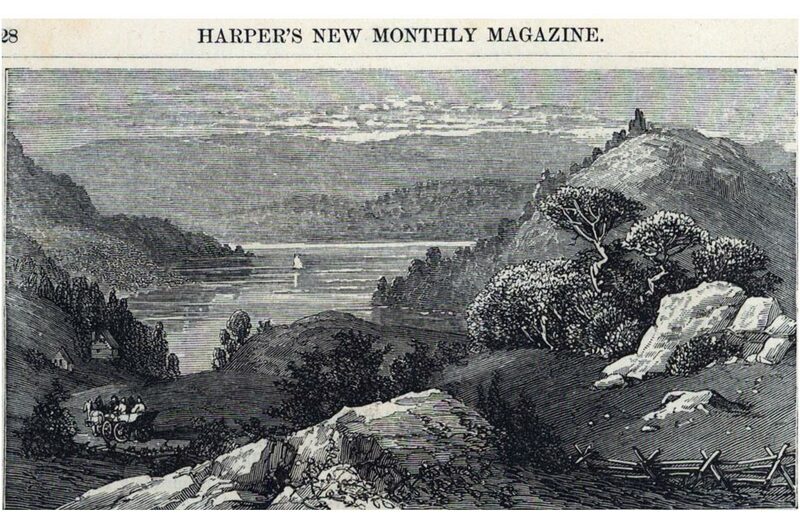 “American Society of Painters in Water-Colours,” Art Journal (1875), p. 92. Catalogue of the Eighth Annual Exhibition, American Society of Painters in Watercolors, Held in the Galleries of the National Academy of Design (February 1875), pp. 6 ff. “Fine Arts: Miss Fidelia Bridges,” Brooklyn Eagle (July 30, 1874), p. 3. “Women Artists,” Art Journal (1875), p. 64, cited in Foster, p. 423, n. 21. See also Charlotte S. Rubenstein, American Women Artists: From the Early Indian Times to the Present (New York, 1982), p. 62. Oliver I. 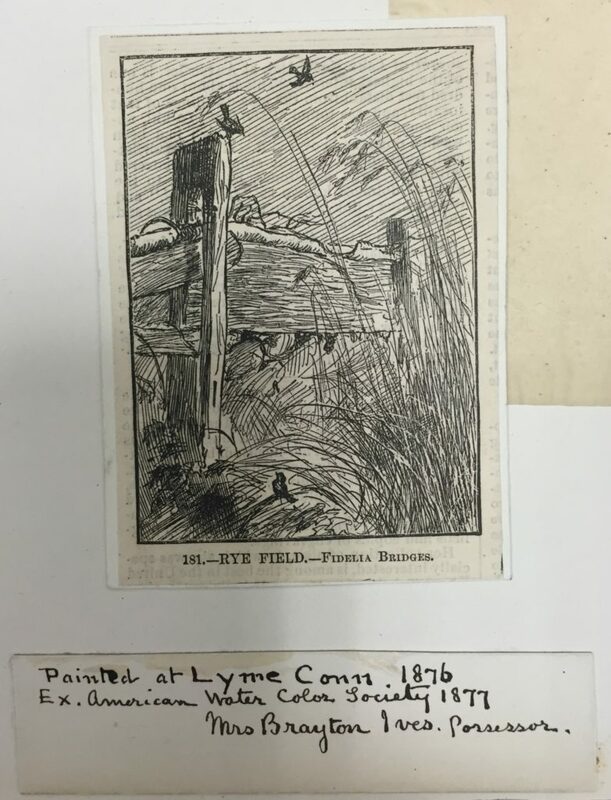 Lay to Mr. Walker, Lyme, Conn., July 9, 1876. Photocopy, LHSA. Oliver I. Lay to Mr. Walker, Lyme, Conn., July 16, 1876. Photocopy, LHSA. Oliver I. Lay to Mr. Walker, Red Hook, NY, August 20, 1876. Photocopy, LHSA. 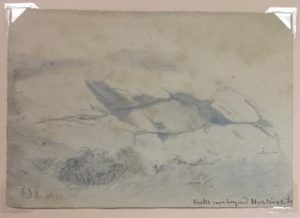 Oliver Lay’s Account Book includes a handwritten list of the 57 sketches and paintings Fidelia Bridges displayed at the Fifth Avenue gallery and notes both prices and purchasers. LHSA. See also Foster, p. 159. Oliver I. Lay to Marian, Lyme, Conn., July 2, 1882. Photocopy, LHSA.